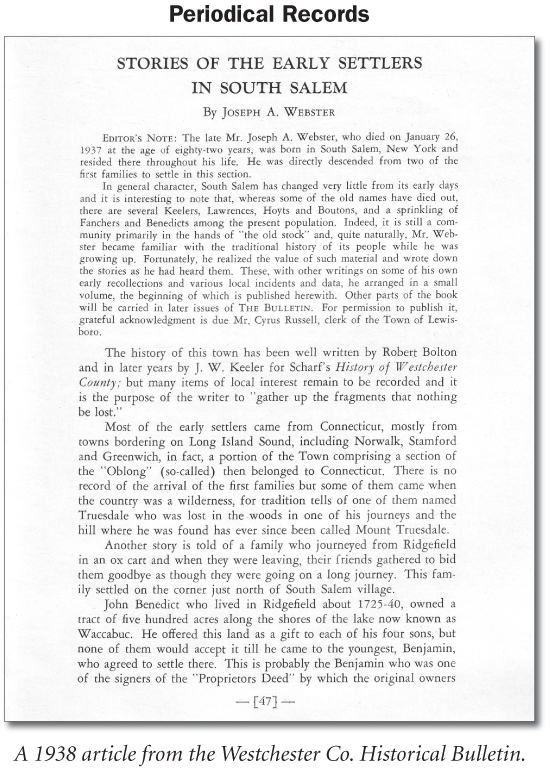 Periodicals are one of most valuable printed sources for family historians. A magazine may have an article about your family or copies of the records you need, such as church and cemetery records. Genealogical periodicals publish a variety articles: compiled genealogies, methodology (how to do research) articles, Bible records, vital records (births, marriages, and deaths), divorces, church records, census schedules (federal and state), photographs of early settlers, probate abstracts, military records, Civil War letters, migration articles, lists of voters, naturalization records, newspaper abstracts, obituaries, abstracts of diaries, court records, gravestone inscriptions, burial records, descriptions of genealogical collections, and much more. You will also find book reviews, genealogical queries, and many other items of interest to genealogists and historians. Libraries, genealogical societies, and historical societies house genealogical and historical periodicals. Some of the largest repositories of genealogical periodicals and indexes include: Allen County Public Library, Fort Wayne, Indiana; Family History Library, Salt Lake City; Library of Congress; and New York Public Library. Not to be overlooked are large university libraries, such as Brigham Young University, Provo, Utah. Genealogical and historical magazines often publish such information as: family histories, obituaries, newspaper notices, church, cemetery, land, probate, tax, military, and naturalization records. Historical magazines may contain biographies and histories of towns, ethnic groups, organizations, industries, historical events, political campaigns, military activities, etc. 1) Family History Library — check the FHL Catalog —do a “Title” search for the name of the publication to see if it’s available on microfilm. 2) Interlibrary Loan — some publications are available through Interlibrary Loan. 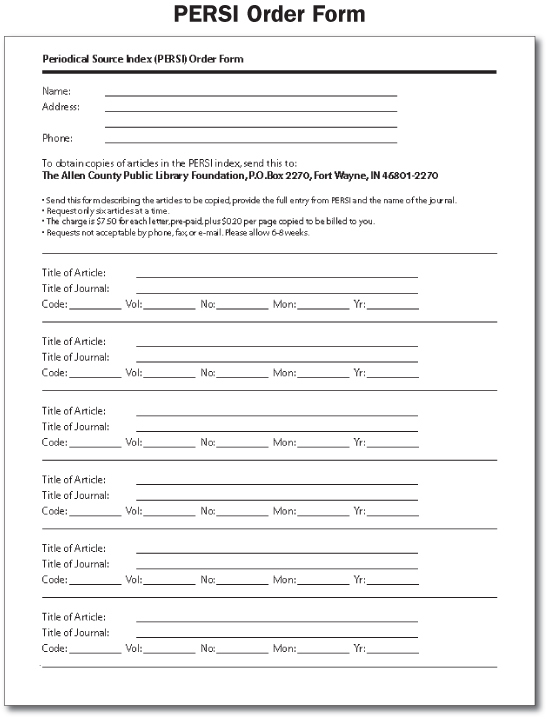 3) PERSI — this is an online index to the extensive Allen County Public Library (Fort Wayne, Indiana) publication holdings; see below for details on how to send for copies of the articles. PERSI is a comprehensive subject index to genealogy and local history periodicals written in English and French (Canada) since approximately 1800. Last year, the Allen County Public Library added more than 100,000 citations, bringing the total number of fully searchable records to more than 1.7 million. The index covers almost 6,000 different periodicals, listing every article according to locality, family (surname), and/or research method. 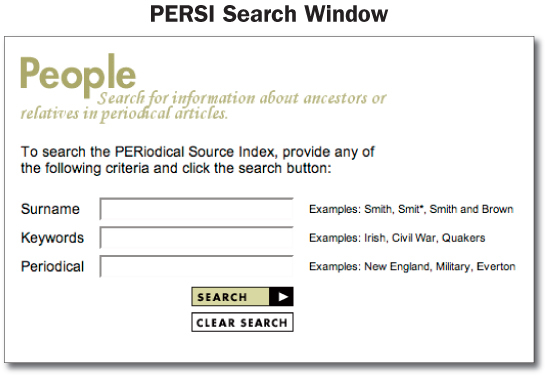 The PERSI Index is available at the HeritageQuestOnline.com or at the Ancestry.com Internet sites. Below are the “search” windows you’ll use to search for information about your ancestor. Conduct either a Surname or Locality Search and you’ll receive a listing of all the articles that fit your search parameters. The listing includes the following: Article Title, Periodical Title, Code, Volume, Number, Month and Year of Publication, and Other Repositories holding this title. 2) Send in the form below to obtain the article. The Allen County Public Library owns a copy of each periodical indexed in PERSI. If you would like them to send you a copy of the article(s) you’re interested in, simply fill out and send in this form with the full entry from PERSI with the name of the journal. You can request a maximum of six articles at a time. The charge is $7.50 for each form, pre-paid, plus $0.20 per page copied to be billed to you. Requests are NOT accepted by phone, fax, or email. Turnaround time is about eight weeks.